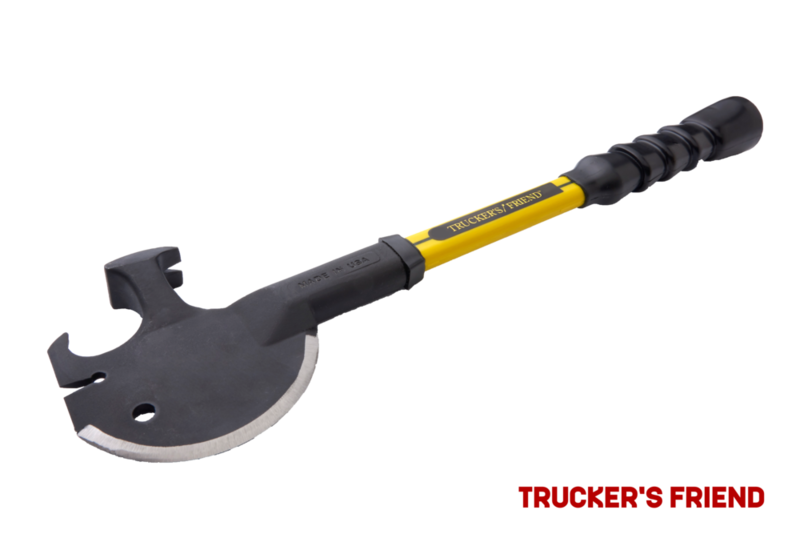 The Trucker's Friend is an all-purpose tool, built tough and originally designed to meet the needs of professional truck drivers. Campers, survivalists, preppers, and everyday users discover the usefulness of this tool. In any situation that requires hacking, prying, pulling or pounding, you will feel real peace of mind with this serious tool on board. It includes curved axe, spanner, hammer, nail puller, tire chain hook, pry bar and lever. The Trucker's Friend features a NUPLA® fiberglass handle with shock absorbing powergrip™. The head is a cast 1055 carbon steel blade and shank that's been heat-treated for extra strength, with a rust-resistant matte finish. This professional-grade tool is truly the trucker's best friend. Whether removing objects embedded in tires, repairing (or dismantling) pallets or chopping away ice and debris, you'll feel real peace of mind with this serious tool in the cab beside you. The Trucker's Friend replaces many tools to make your hiking, hunting, camping or other off-road experience safe and enjoyable. Whether chopping kindling, pounding tent stakes or even for protection from wild animals, you'll be glad for this strong companion on your next trip 'out there'. The Trucker's Friend is an indispensable addition to every tool kit - both for professionals as well as DIYers. Whether on the job site, in your home workshop, around the farm on in the trunk of your vehicle, you'll be glad for the company of this unique and versatile multi-tool. Whether breaking your way out of a burning vehicle, prying up debris to free a trapped victim, or for aggressive self-defense; in any situation that requires hacking, prying, pulling or pounding, the Trucker's Friend can be a true lifesaver. Used by Search-and-Rescue professionals.